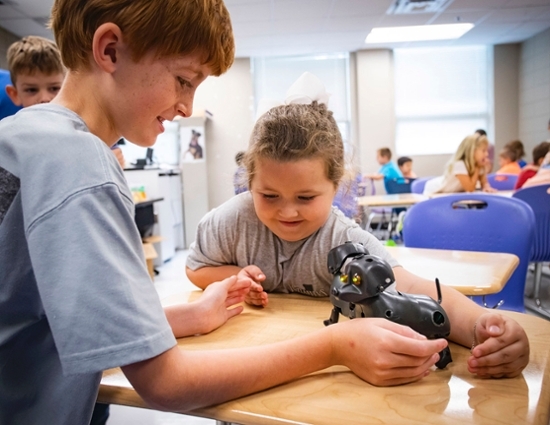 2018 Camp Invention attendees were able to work with robotic dogs and learn about engineering and biology along the way. 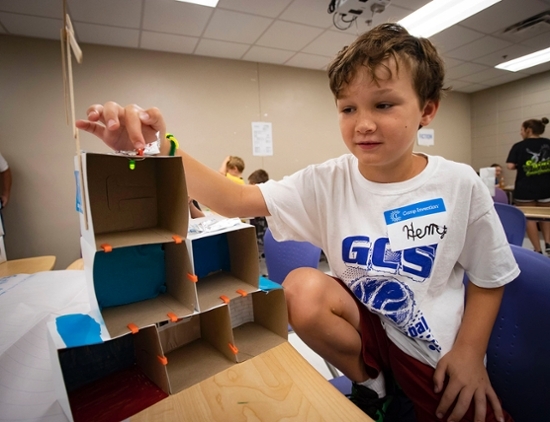 Camp Invention helps kids discover the fields of science, technology, engineering, and math through building things like this mini mansion equipped with smart technology. VALDOSTA — The sounds of excited elementary schoolers filled classrooms in Nevins Hall June 11-15 as Valdosta State University hosted its seventh Camp Invention, a weeklong summer program that gives students in kindergarten through sixth grade the chance to dream, innovate, and create in the areas of science, technology, engineering, and math (STEM). In one classroom, participants built mini mansions equipped with smart technology and cutting-edge gadgets. One room over the young campers acted as futuristic veterinarians, working with robotic dogs and learning engineering and biology principles along the way. “This camp makes them think outside of the box,” said Alisha Sirmans, a Lanier County pre-k teacher who has taught at Camp Invention for the last five years. “It exposes them to a variety of different subjects and lets them do things that they normally wouldn’t get to do in a regular classroom. Dr. Denise Reid, professor of mathematics and coordinator of VSU’s Camp Invention, said the program’s activities are essential to future growth in STEM fields. Camp Invention becomes a family affair for many as kids and their siblings attend year after year, ready to discover new worlds of creativity and innovation. Reid’s daughters, Rena, 17, and Callie, 15, both attended Camp Invention for many years and now participate as counselors, and her son Jacob, 12, attended for all seven years and was a counselor-in-training this summer. Additionally, Dr. Reid’s husband, Lamar, who is a teacher at Atkinson County Middle School, has volunteered to help direct the camp for the past seven years. VSU’s Department of Mathematics hosts Camp Invention annually in partnership with the National Inventors Hall of Fame. It is the only nationally recognized nonprofit elementary enrichment program inspired by the brightest thinkers around — the National Inventors Hall of Fame inductees. All activities are designed to be fun, hands-on, challenging, and age-appropriate, with a focus on encouraging problem-solving, teamwork, innovation, and entrepreneurship. Camp Invention attendees invent something new every day, from a dancing dinosaur to a cupcake catapult, and explore fun realities, such as the chemistry of magnetic slime, as they experience what it is like to be a physicist, engineer, and entrepreneur. Through collaboration, discovery, and invention prototyping, they are able to solve real-world issues.